A traditional Bastide house, with 2.4 ha of Provencal scrubland, in a dominant position with Mount Sainte-Victoire in the background. 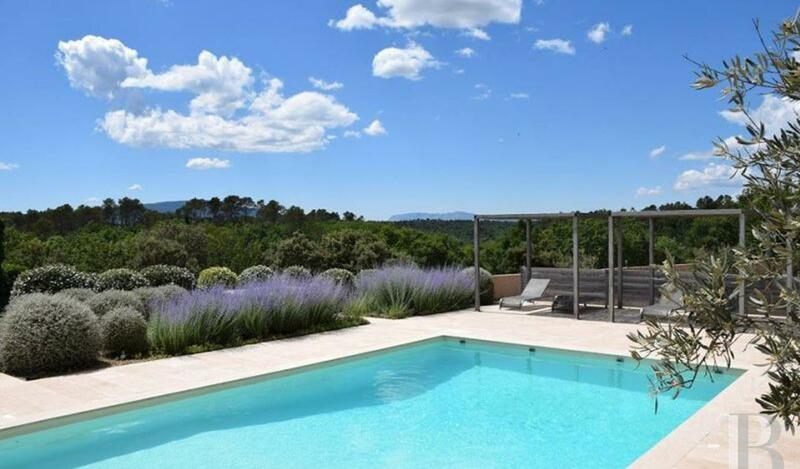 This property, in the south of France's department of Var, spans more than two hectares. At an altitude of 300 m, it dominates the Provencal forest and valleys of Mediterranean scrubland. Mounts Sainte-Victoire and Sainte-Baume can be seen in the distance. The town of Brignoles is 10 km away, with a slip road for the A8 motorway. Hyères-Les-Palmiers airport is about 30 minutes away and that of Marseille-Marignane is 70 km away. There are many hiking trails in the area around the property. The Mediterranean Sea and the beaches of Hyères, Le-Lavandou and Cap-Bénat can be reached in less than an hour. This large, traditional Bastide house, with its light-coloured, sober façade, faces south and remains sunny all year round. The house is extended on either side by additions with Roman tile roofs of varying heights. Olive trees in large, white-leaded, wooden planters provide an air of Aix-en-Provence. The large swimming pool, at the foot of a few steps, is flanked by stone paved decks. Throughout the grounds, one hundred year old olive trees and pergolas, dotted here and there, provide shade in the summer. A fountain, with a dressed stone pool and a column with a capitals, is to be found in one of the landscaped alleyways near to the swimming pool. Further away, the pool of a wash-house and its fountain provide a touch of serenity to the pastoral surroundings of the Bastide. The enclosed space, in which it stands, continues over almost 1œ hectares beyond the fencing. Young olive trees grow amongst maritime pine, pubescent oak and other forest plants. The traditional Bastide houseThe architecture of this home, constructed in the 20th century, is typical of that of traditional Provencal Bastide houses. Its main facade spans two levels. Semi-circular arched French windows are fitted with Provencal shutters, made of horizontal strips of wood and painted the colour of flax. The facade is also decorated with wrought iron railings and a balcony. A sun terrace has been laid out on the biggest terrace, the floor of which is paved with dressed stone. A terrace opening into a bedroom is enclosed by a balustrade composed of natural boughs. Two single-storey extensions, on either side of the Bastide, adjoin the house. The main terrace looks down on the swimming pool area. A summer kitchen has been installed as well as pergolas ready and waiting for those deckchairs.